The last time I've hiked to the Pali Notches was back in July of last year with Ian. 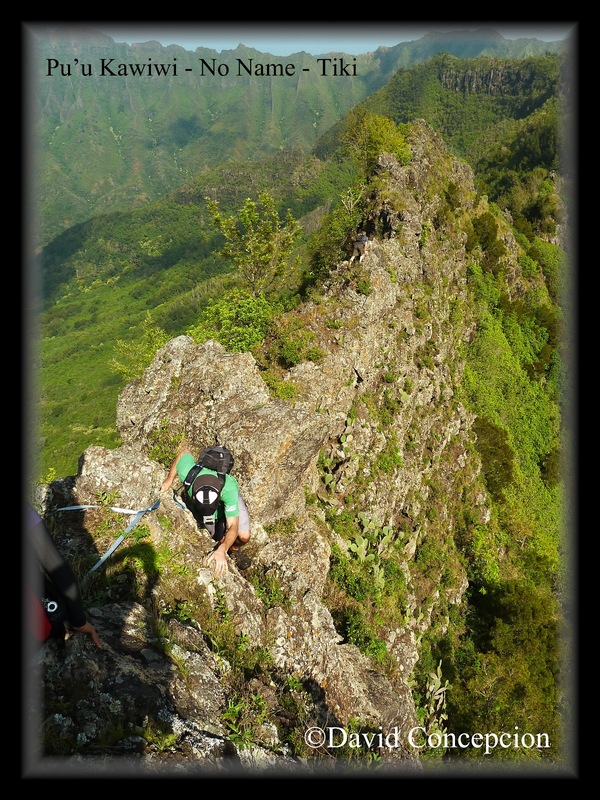 We only went as far as the nub just before the suicidal wall, "Chimney", and the rest of the ridge that heads up to the tallest peak of the Ko'olaus, Konahuanui. This ridge starts at the Nu'uanu Pali Lookout and comprises the east, southeast portion of the Nu'uanu saddle, one out of three "highway" (H-3/Moanalua, Likelike/Kalihi, and Pali/Nu'uanu) saddles that feature some of the most nerve wrecking hikes on the island. 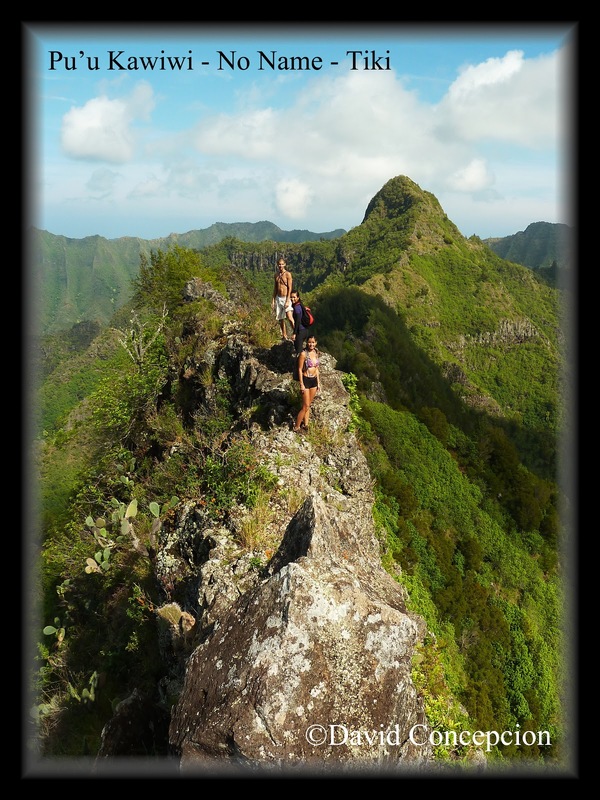 Last month, Pete Clines, Laredo Murray, and Duc Ong successfully climbed up Pali Notches to Konahuanui and descended Piliwale Ridge, all in one hike! There's been speculation about the use of the 2 notches that sit high above the Pali Lookout with a commanding view of Nu'uanu Valley. During the battle of Nu'uanu, King Kalanikupule and his remaining defenders of Oahu were driven back to their last stand at the Pali Lookout. They fought a vicious battle for survival against the overwhelming army of King Kamehameha. Kalanikupule had his troops ascend the ridgeline leading up to Konahuanui to dig two notches on a flat section of the ridge. Whether if these notches were already natural or carved out by the army remains a mystery. There is also debate whether if cannons were installed in each notch or if they served as sentry posts for scouts who directed cannon fire. Either way, Kamehameha sent up his best troops up Konahuanui from Tantalus and descended the "Pali Notches Ridge" to sack the cannon crew and or sentry men. It was reported that Kamehameha was listening for the silence of the guns and that once they were, he knew his men succeeded. On this day, five other people (Chenay Borja "HC GMa", Marcus Griego, Howard N. Uyeda Jr., Chris Maria, and Michael Loftin) were daring enough to join me to relive that historic feat, except we would be doing it in reverse! 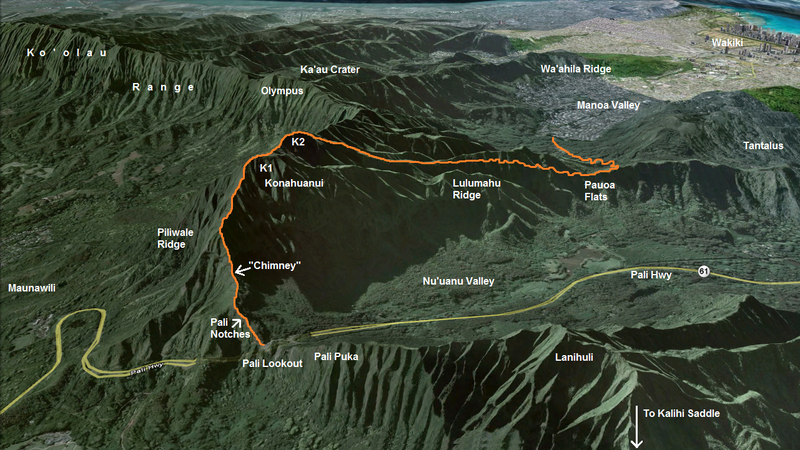 Our goal: summit Konahuanui K1, via the ridgeline consisting of the Pali Notches, and then descend the Konahuanui Trail to Pauoa Flats. From there we would exit via the Manoa Falls Trail. The weather was absolutely perfect, a cloudless Ko'olau spine as far as the eye can see. Winds were calm and there was slight haze due to the vog. Marcus picked me up at Ewa Beach and we met HC GMa at the end of Manoa Rd (residential area) at around 6:30am. Once we staged a car there, we headed on over to the Pali Lookout to meet with the rest of the crew. Howard would also stage his truck at Manoa Rd as well. I also got the opportunity to meet Howard's friend, Chris. Once past the 2nd notch, we hiked a flat section of the ridge until we got to the nub. That wall was just as terrifying looking as last year. Once in the small saddle between the nub and the wall, we began our preparations for our vertical ascent. Looking upwards, we could make out a long knotted rope and another rope that was wrapped around two metal stakes to act as some kind of guide. We decided to ascend barefeet, as it surprisingly provides extra traction to the sometimes moist rock. Chris was up first, followed by GMa and Howard. I was up next and I started up it's left side. Once at the metal stakes, I followed the rope upward and crossed over to the right side of the wall where I grabbed the knotted rope. With both ropes in my hands, I heaved myself upward to the "Chimney", where one is sandwiched between two massive featureless slabs of rock. There are absolutely no foot/hand/elbow/head holds whatsoever. The two slabs of rock are so smooth, they might as well be two slabs of ice! With only two ropes acting as my life support, I jammed my knee between the 2 rocks and was about to use my back as a means of friction when I realized that my pack was still on me. Darn. I called up to Howard to see if I could throw my pack to him. Once he was in position, still hanging on to the rope with my left hand, I slid my hand under my pack and took it off my back. I hurled it up as hard as I could, landing to a spot where it was within reach of Howard. He grabbed it and tossed it aside as I somehow shimmied upwards and made it to a "flat" ledge separating the walls below and above us. Michael Loftin was up next and he powered up it almost effortlessly and Marcus was last to reach the ledge. With the Chimney behind us at last, we all breathed a sign of relief, not knowing what was ahead of us. I proceeded to put my shoes back on. Continuing our steep climb upward, we encountered a dead branch with an old looking white cloth or something that was wrapped around it. Beyond that was our next problem, a concaving rockface that was occupying just about the entire width of an already narrow ridge. The windward side of the face was nearly impossible to climb and the townside had an almost non existant ledge that contours around it to the right. Chris scouted the town facing side but was spooked by the death drop. Howard who was next, assisted him as he climbed directly up and over the face. After a lot of this and that, Chris somehow made it over and Howard contoured over to the townside facing side and climbed it. He affixed a rope for the rest of us to climb. GMa was next with the contour and as usual, made it look all too easy. I was next and at first could not make any head way. It was then I decided to try it barefeet again and was able to make it to the rope and climbed up without incident. Marcus and Michael followed. Howard then uninstalled the rope that he installed just in case we needed it further upridge. With that obstacle out of the way, we climbed upwards, the ridge easing off slightly. It transitioned from a rocky wall like appearance to a more green and overgrown ridge, typical of Ko'olau summit ridge walking. We eventually reached a nice clearing where we took a break. We gazed out at the windward expanse, albeit some vog. There wasn't any clouds except some cirrus clouds, indicating an approaching cold front. With the sun beaming down on us and the near absence of wind, it made for a hot and sweaty break. Marching on, we climbed a small knob and I noticed a side ridge coming in from around the area near the Pali hairpin turn. I remember Pete Clines mentioning attempting but unsuccessfully climbing "Konahuanui Windward" because the last few hundred feet or so was simply too steep. I gazed at the grade of the ridge and I concur! From our vantage point we could make out the remaining ridgeline leading up to K1. The ridge narrows considerably, but never to True Manamana proportions, however there are two spots along it where it may slow one's progress. There is a good sized boulder that occupys the entire width of the ridge and another almost vertical climb to gain a good sized knob. There's a tree that helps you with the bottom most portion of the climb. Beyond those two, the summit is easily within reach. The adjacent windward ridge to the left, which eventually intersects the ridge we are on further near the summit, is the infamous Piliwale Ridge. Sure enough, some 50ft vertical feet before the summit was a junction with a trail leading off to the left and then disappearing into the depths below. This junction was the topping out point of Piliwale Ridge. We topped out at K1 summit at approximately 12:20pm and after a short break, crossed over to K2 and proceeded down the Konahuanui Trail. As we descended, I pointed out a clearing where I spent the night last July during my hike on Piliwale Ridge. We then reached the Puaoa Flats lookout at 3pm and made our way down the Aihualama switchbacks to Manoa Falls. After a refreshing rinse, we exited via Manoa Falls Trail and were at the cars a little after 4pm to conclude our wild adventure! (5-23-2011 Note: Recently, hikers wanting to descend the Pali Notches ridge and Piliwale from Konahuanui K1 have been getting disoriented with this junction, especially when it's socked in with clouds. If starting your descent from K1, you will come upon this junction. Taking the trail to the right heads down Piliwale Ridge to Maunawili Demo Trail while the left trail takes you down the Pali Notches ridge, which terminates at the Pali Lookout. 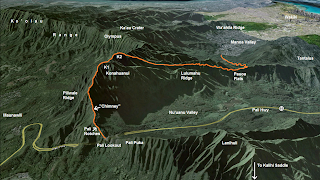 If one heads to the terminal point of the Kamaile'unu Ridge trail, he/she would have a commanding view of Makaha Valley to the left and Wai`anae Valley to the right with massive Mt. Ka'ala looming dead ahead. Beyond the terminus, still on the Kamaile'unu Ridge, there are three peaks that are situated just prior to the ridge making it's climb to the top of Ka'ala. These peaks are as follows from Kamaile'unu terminus going towards Ka'ala: Pu'u Kawiwi, No Name Peak, and Tiki. Beyond Tiki, the trail eventually combines with the Wai`anae Kai Loop Trail and then the Three Poles which marks the Wai`anae - Ka'ala (W-K) Trail. I was monitoring the weather forecast days prior to this hike and they were calling for an 80% chance of rain island wide. As the day drew closer, that was lowered to 50%, and finally 30%. With the odds in favor of us, I called on the 808 Goonies (Marcus, Chenay "HC GMa", Josh) along with Randy, Bogie, and Marga. We all met at 6am at the Tamura Supermarket and shoved off for the Wai`anae Kai hunting grounds. Starting off at 6:30, we began our upward grind on the paved road that snakes it's way into the deep reaches of Wai`anae Valley. After passing the water tank on our left, we veered left off the paved road by a utility pole onto an indistinctive trail that heads into the forest. Eventually it reaches a grassy clearing and one can see the imposing ridgeline that climbs up the south side of Kawiwi. The climb begins initially in sometimes thick grass then quickly transforms into scrambling up several rock faces. There's a certain point where one can see the remainder of the climb to the summit. While it appears impossible to climb, looks can be deceiving. On the worst rock faces, there's a trail that contours on it's right side, marked by ribbons, although one can choose to climb the faces directly. There was one particular rock face where I climbed it directly and upon reaching up the very top of said face and grabbing it, the whole top boulder cracked apart and I was briefly holding the boulder with my right hand! Not being able to hold the massive weight for more than a split second, I yelled out to GMa who was below me to watch out for this boulder! I deflected the boulder over to my right and sent it plummeting down below, making sure it was far away from her. Just prior to the summit, there was one last major rock face that looks totally impossible to climb but up close, one climbs on it's left side and contours over to it's far right and continues climbing upward. We topped out at the summit of Kawiwi (2,975ft) at around 10:15am and took in the commanding views around us. Looking north, we could make out the jagged ridge line of Kea'au and `Ohikilolo Ridge. Looking south was the Wai`anae spine with Kalena, Hapapa, Kanehoa, Kaua, and Palikea. Eastward loomed flat topped Mt. Ka'ala and finally looking towards the ocean, there stood the terminus of the Kamaile'unu Ridge trail, towering high above us. I remember reading an old OHE article which recounts Al Miller's single day outing that took him up Kamaile'unu, past Kawiwi, No Name, and Ka'ala, and down Dupont to Waialua! 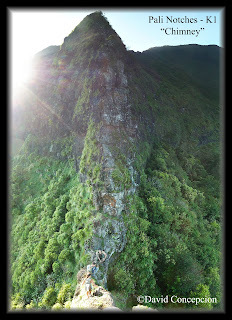 We continued on the ever so narrow dike with massive drops to Makaha Valley to our left and Wai`anae Valley to our right. It then dropped down to a saddle. Eventually we came upon, you've guess it.... a fence! However this fence would prove useful as we desended the steep narrow dike. At the bottom of the saddle was a climb up a rockface with the aid of a yellow and orange strap. Beyond, the ridge morphed into jagged boulders that were arranged in a peculiar way, as if it were a giant jigsaw puzzle! We either contoured or climbed over the smooth rocks. We took a short break in a nice shaded flat section, the intense sun being blocked by the massive wall of rock. Eventually the ridge morphs yet again into a rather gentle stroll through Ironwoods. I've read that there existed a junction with a side trail somewhere in the Ironwood grove that drops back down to Wai`anae Valley, a good bail out route should the need arise. The Ironwoods later open up to low vegetation surrounding the ridge and one can see the massive peak of No Name. Far ahead I could see Randy, already half way up the steep ridge. How did he get there so quickly with a giant rock face that was directly below him?! I would soon find out that the climb up No Name is incredibly easy as there existed a really wide trail that contoured around and up the worst sections of the rock faces and I before I knew it, I was already with Randy and him and I waited for the rest of our group to catch up. We reached the top of No Name (3,000ft) at around 12:30pm, just in time for lunch. Snacks and drinks were consumed while we proceeded to leave our ribbons at this summit. Looking back towards Kawiwi, the clouds were creeping up from behind us and did a spectacular "cloud dance" as the Makaha side of the ridge was socked in and the Wai`anae side completely free of clouds! Down below in Wai`anae Valley, we could hear numerous hunters whooping out, possibly to their dogs. As we descended the Ka'ala facing side of No Name, we could see that Tiki wasn't that far away. I wouldn't call this a "summit" in the normal sense. I guess it stands out because here is a very odd looking pinnacle of giant boulders that were arranged in such a way that it looked like a pair of Tiki torches standing tall and proud. About 50 yards or so prior to reaching these rocks, we had to traverse along a fence. We were at Tiki in about 30 minutes or less. Once at Tiki, Randy and GMa began scouting down the south side and descended two black straps, followed by white ropes that were in horrible shape. Beyond the white ropes, they lost the trail. Apparently it didn't dawn on us that just after the second black strap (I was actually standing at that exact spot), one had to actually veer right a bit to pick up the trail that heads back down to Wai`anae Valley (There's a tiki statue on one of the trees that marks the trail). Giving up, we decided to continue along the crest towards the Wai`anae Kai Trail and the Three Poles. The fence continues past Tiki for a short while, the trail switching over from one side to the other a couple of times, requiring us to hop over the fence. Then the fence finally ends for good (Thank goodness!) and the trail comes upon a clearing that was evidence of a recent forest fire. Beyond the clearing, one can literally trail run all the way up to Three Poles as the trail was in excellent condition. Pausing briefly at Three Poles, we gazed at the ridge, continuing it's upward rise into the now socked in summit of Mt. Ka'ala (W-K Trail). We then proceeded down from the crest and into the Wai`anae Forest Reserve via the lower half of the W-K Trail back to the paved road to complete our roughly 7 and a half hour loop hike!